I am pleased to report that the ICO is actively considering the Duchy of Lancaster case. Recently I have been contacted by several people about this case and I think it is right that I keep interested parties updated. I do not want to go into too much detail as it might not help the case. “2.23 The Regulations do not apply to any public authority when it is acting in a judicial or legislative capacity. This derives from the provision in the Aarhus Convention that the definition of public authority “does not include bodies or institutions acting in a judicial or legislative capacity”. I am very grateful to the ICO official assigned to my case for his detailed consideration of the issues. For those of you that have been following the Duchy of Lancaster Saga I have a brief update. (1) A much more detailed letter explaining the Commissioner’s view that the Duchy is not a public authority under the Regulations. This verdict can be challenged by judicial review. Email from Information Commissioner’s Office dated 26 November 2009. Section 21 is intended to apply to information that is already reasonably accessible to the applicant, e.g documents published on the internet or in books available to your local library. Unfortunately, some public authorities are using where the information can be obtained by making a very large number of queries to locator tools. For example in theory it is possible to obtain the phone numbers of all tax offices using the locator tool on the HMRC website. In practice it is very difficult to find the number for every office and even when you think you might have found them all it would be difficult to be sure that you really have. I had requested a list of phone numbers and HMRC are trying to use this exemption. I could try entering the name of every town in the UK into the “Enter town” field but I am not sure there is a definitive list of UK towns and even if there was I don’t think ‘Birmingham’ would be on it but there is an entry when you search for Birmingham. There is however what amounts to a definitive list of UK postcodes so in theory I could conduct a exhaustive search for tax offices, but according to UK National Statistics website there are somewhere around 1.7 million live postcodes so it be wholly impractical to search for each of these one at a time. The exemption was never intended to be used in situations like this so I have sent HMRC a robust request for an internal review. I have argued that information that can only be obtained by making a query using the locator tool is only available on request albeit that the database is set up to automatically respond to such requests. As HMRC do not refer to the locator in their publication scheme I argued that the exemption could not be relied upon. I hope the Revenue will accept on reflection that the data should be provided to me in a form I can reasonably use, it was certainly the intention of the Act that I would be able to obtain information of this nature. A lot of people who make FOI requests like to get the data in electronic form and I include myself in that. These leaves open the possibility of the public authority arguing that it is not reasonably practicable. I actually think that it is better to only provide an email address and refuse to provide a postal address. You may need to remind the public authority that you have submitted a valid request for the purposes of the Freedom of Information Act and that they have a duty under Section 1 to supply you with the information requested. This leaves them with no real option but to reply electronically. The link was to a response from the Scotland Office I had received where I had simply refused to provide a postal address. You can click on either of these pictures to see a larger image. 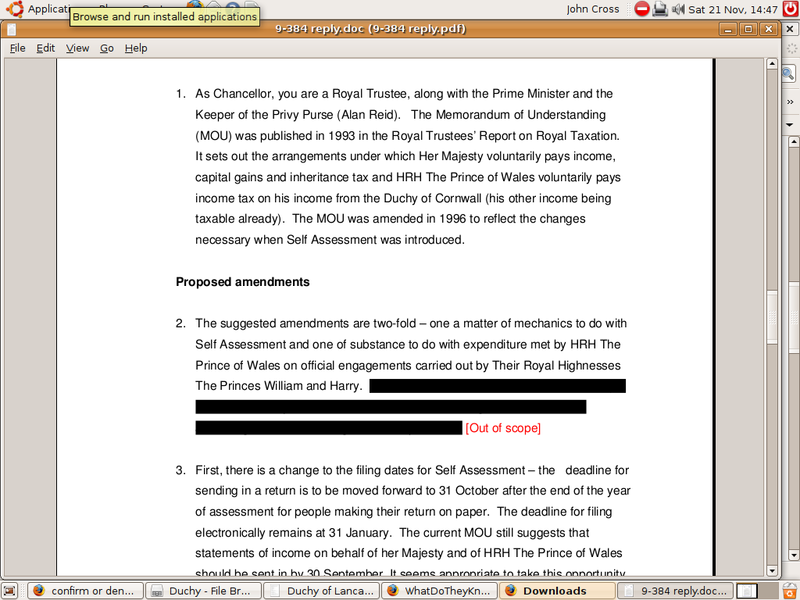 You can also read the original document – to read the redacted text just highlight the relevant paragraphs with your mouse. 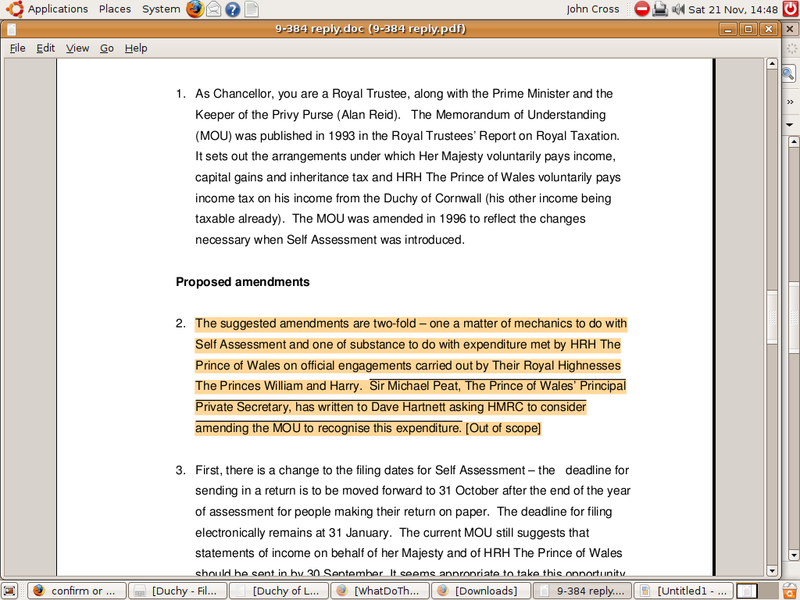 The hidden text exposes the fact that Prince Charles was secretly lobbying to get the rules changed so he could pay less tax. 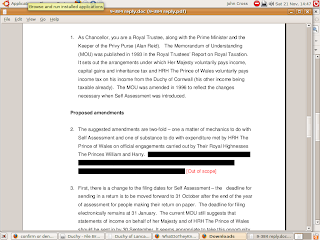 Posted in monarchy, redaction, tax. I am normally strongly against Post Office closures as I think the closure of a Post Office can contribute to the isolation of communities and of individuals. We all have to recognise though that providing a Post Office costs money and the money has to come from somewhere. I have recently obtained figures from the Royal Mail Group about the cost of running the Court Post Office at Buckingham Palace. 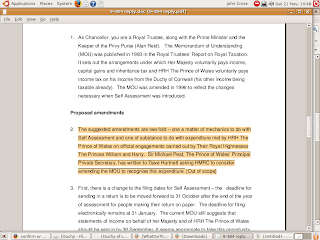 The cost is paid for by Grants-in-Aid from Government Departments i.e. the tax payer. The total cost for the year 2008-2009 was over £560,000. The postage cost was just under £255,000 while staffing costs exceeded £260,000, the remainder consisted of administration, travel and equipment costs. At a time when the public sector is looking to make savings and get the best value for the tax payer, it is amazing that the Court Post Office is still open. The postage cost would be similar whether or not the branch remained open but other costs would be drastically reduced. I estimate that the closure of the Royal Post Office could save the tax payer in the region of £260,000 to £300,000 a year. Let’ put that saving into context, it would cost £180,000 to keep around 10 rural branches open at a cost of £18,000 per branch. Think of the difference that would make to those communities. Pat McFadden was at the time the Minister of State for Employment Relations and Postal Affairs.